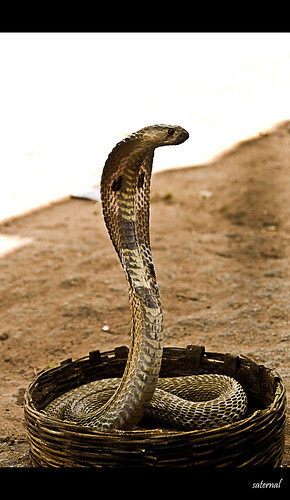 Naja naja is a species of venomous snake native to the Indian subcontinent. In India, the spectacled cobra is much respected and feared, and even has its own place in Hindu mythology as a powerful deity. The Hindu god Shiva is often depicted with a protective cobra coiled around his neck. Vishnu, the preserver of the universe, is usually portrayed as reclining on the coiled body of Sheshnag, the Preeminent Serpent, a giant snake deity with multiple cobra heads.